As the rate of people using mobile devices to browse the Internet grows, Google has been making changes to their mobile search experience so that it better suits the needs of mobile users. On February 26th Google they took that experience to a whole new level. They do not specify if this will have an effect on desktop rankings, but there is widespread speculation that Google will be considering mobile-friendliness for their desktop ranking very soon, if they do not already. You Can’t Ignore the Facts! 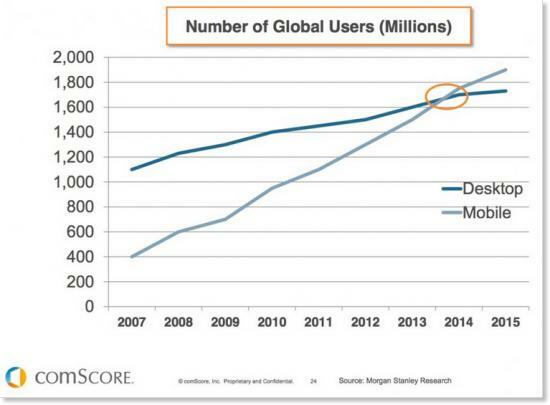 As illustrated in this graph by comScore, we’ve already seen the number of mobile internet users surpass the number of desktop internet users in 2014 and that trend keeps on growing! In fact, according to recent Marketing Magazine study, 87% of consumers use their mobile devices to conduct searches at least once a day. How can anyone ignore this powerful fact? If your website is not optimized for mobile you are missing out on a serious amount of revenue opportunities. Not only is it important to have a mobile friendly website for your Google rankings, but that’s what more than half of your customers want. If you don’t provide them with a good experience when they’re on your website using whatever device they’re using, they will simply choose another option. Sure you can have a website that’s optimized for people using their desktop computers and a separate mobile site for people using mobile devices, but that can be tedious to manage and the user experience is not congruent from one device to another. The simplest and most effective way to ensure that your website is optimized across all devices to help boost your search engine rankings and provide your customers with the best possible experience is to have a well designed responsive website. In addition to being more user-friendly and having a positive impact on your search engine rankings, responsive websites typically have lower bounce rates and higher conversion rates. This means that more of your visitors are likely to turn into customers with a well designed responsive website. Even though April 21st is just around the corner, there is no need to panic. Google provides you with tools and resources to help you better understand this algorithmic change and determine what you need to do to optimize your site for mobile usage and Google rankings. Google’s Mobile Friendly Test analyzes your website’s mobile-friendliness and lets you know where you stand. Simply input your website address and wait. They also provide you with detailed guides that can teach you how to make your website mobile friendly using various website building platforms like WordPress, Blogger, Drupal, and more. 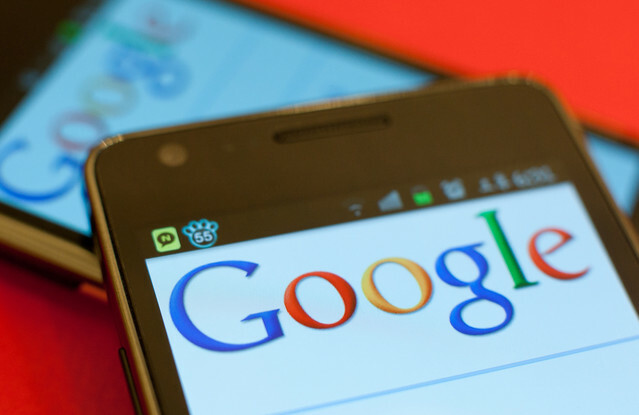 Perform Google’s Mobile Friendly Test. Check to see where you stand and what changes you need to make to stay in the game. Before performing any changes or updates to your website I recommend that you backup your site. If you’re not sure how to do that, contact your CMS provider or browse through Google’s Webmaster Support Community. Update your CMS. In some cases simply updating your CMS (Content Management System) will apply the necessary security upgrade to make your site mobile-friendly. Verify that you’re using the most current version and install the needed security upgrades. Remove Flash Components. If your website has any Flash components, then they need to be removed. Flash is still not viewable on many mobile devices, and will render your site less mobile-friendly. If you really want special effects on your website, try using HTML5 instead. Analyze your custom themes. If your website uses a custom theme, verify that it is mobile friendly or responsive. If not, then you will need to change it. A responsive website makes it easier for you to be found on Google and for your customers to navigate through your site on any device they choose to use. A responsive site automatically optimizes itself to fit all screen sizes and resolutions. With more than half of internet users using mobile device to browse the internet, it is important to provide them with the best experience possible to ensure they choose to do business with you instead of your competitors. April 21st is less than a month away, so prepare yourself and stay relevant on Google search results. To learn more about Google’s new Mobile-Friendly policy and for help with ensuring that your website is ready for the changes, please reach out to me at steve@unoapp.com. I’ll be more than happy to chat. Why Aren’t You Already Cross-Posting On LinkedIn?